Can a single OS work for all the devices in your life? Back in 2004, Linux was a considerably more technical world than it is today. Even the more novice desktop flavours involved installation procedures, choosing tools, limited documentation and, at times, complex configuration. Though many of us dreamed of the power of Linux simplified for all, it was, by definition, a geeky domain. Back in 2004 Canonical's distro came in one form: Ubuntu for the desktop. Nine years and 19 releases later, Ubuntu is overseeing a far more ambitious mission: to create a single converged operating system that runs across the desktop, phone, tablet and TV, as well as the cloud and the server. Of all of these platforms, right now the focus is very much on building the first version of the Ubuntu Phone. Fortunately, due to the convergent nature of this business, the majority of this work benefits each of the other devices too. Ubuntu has always been a traditional Linux distro that pulled together a collection of open source projects and integrated them to make them work well together. Although Ubuntu's core code was sourced in other projects - the Linux kernel, Gnome, X Window System and Libre Office - the integration work was complex. It involved bringing together all those disparate components, user interfaces, dependencies and more into a single consistent system. Ubuntu quickly became the most popular desktop Linux distro and it attracted attention not just from the Ubuntu community, but from the mainstream media as well. The decisions Ubuntu made impacted on the wider Linux world almost as much as they did on the distro. The growth in Ubuntu also generated commercial interest. Before long, the four largest OEMs in the world were shipping Ubuntu pre-installed on their systems, and the introduction of Ubuntu Server was generating interest from server hardware manufacturers and service providers too. Remember, this was back, largely, in the days when most hardware came in the form of desktops, laptops and servers. But then the market changed. With the arrival of increasingly powerful smartphones - largely driven by companies wanting a piece of Apple's pie - the hardware world started to evolve. Before long, we had a new generation of netbooks, mobile internet devices and tablets. The mobile industry was hotting up and the hardware industry was exploring new avenues; it became obvious to Canonical that in order for Ubuntu to stay competitive, it needed to harness this new revolution, not merely dig its heels into the desktop and refuse to acknowledge change. The start of Ubuntu's evolution into a new converged world was the introduction of the Unity desktop environment in late 2009. Shortly before it introduced Unity, Canonical had been exploring refinements and improvements to Ubuntu in the form of the messaging menu and new notifications. These changes were not merely engineering ideas promoted to shippable state, they were design-driven, user-tested features that solved many of the problems the developers had witnessed users experiencing. These early refinements transitioned into a wider plan in the form of Unity, so named to deliver a unifying experience. Unity was intended to simplify the desktop, maximise screen real estate, and challenge many of the presumptions people had about the traditional Linux desktop world. Canonical continued to share work that contributed to the vision of one familiar interface that would work on multiple platforms. Ubuntu for Android enabled a docked Android phone to boot a full Ubuntu desktop. Much of this work was possible due to Canonical's close relationship with Linaro, an organisation that consolidates and optimises open source Linux software, ensuring that the Ubuntu archive could run on ARM devices. 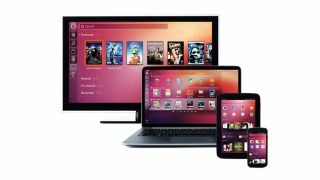 Ubuntu TV demonstrated the design principles of Unity applied to television, but the convergence story really kicked off in January, when Canonical announced Ubuntu for phones, quickly followed by Ubuntu for tablets. With Ubuntu available side-by-side for comparison on a desktop, phone, tablet and TV, the convergence was visible and intriguing for onlookers, particularly at the Mobile World Congress (MWC), where the entire vision was exhibited.